Ever since I had a class back in the 1980’s I’ve been fascinated with Native American literature. The themes and styles, while certainly unique to the individuals, have a characteristic that identifies the writer with the Native American culture. Only two of these authors (Leslie Marmon Silko and Sherman Alexie) were familiar to me before reading this. My favorite stories here were Sherman Alexie’s “War Dances” which takes up the bulk of this slim volume and has a tendency to wander, but that is part of the charm as well. “The Dog Pit” by Eli Funaro was not necessarily a ‘fun’ read but it definitely evoked images that I’m still seeing. “Only Approved Indians Can Play Made in USA” pays powerful attention to the racial bias of the Native American as only ‘American’s’ can do it. Author Jack D. Forbes addresses the issue ‘what makes someone an ‘Indian’?’ in the story. Leslie Marmon Silko’s “The Man to Send Rain Clouds” was part of my reading back in college. I loved it then and it’s still a tremendous work. I liked that the works stretch back a few decades and “The Soft-Hearted Sioux” by Zitkala-Sa was written in 1901 and tells a fascinating story of a young man returning to his Sioux reservation as a missionary. If you’ve ever wondered how Native American authors might tell stories differently than the whites on their land, then this is a great place to start. Looking for a good book? 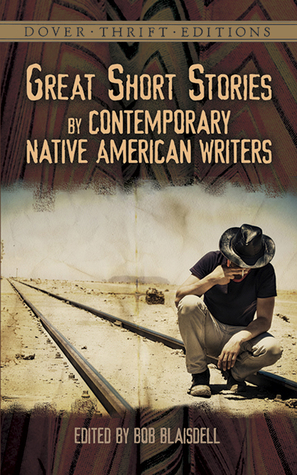 Great Short Stories by Contemporary Native American Authors (edited by Bob Blaisdell) is a slim volume and it won’t take you long to read, but the stories and ideas may stay with you forever.